How much do you really love owls?? This bundle is a collection of all my owl materials and is created for the teacher who loves "all things owls." From center games to classroom decor, this resource will have you covered when it comes to the owl theme. 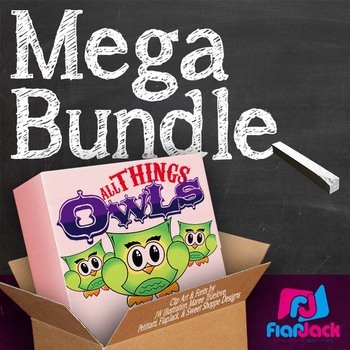 And with this purchase, not only will you receive the following owl-themed resources at nearly a 50% discount ($47.50 total if purchased individually), you will also be able to download any future owl resources I create and add to this bundle. Kind of like a FlapJack owl subscription. Please download the preview or click on the following links to see all that is included. Editable Owl-Themed Morning Work PowerPoint Templates ($10) - Too busy to decorate for the seasons and holidays of the year? Brighten your room every season with these 13 different owl-themed PowerPoint templates that you can use to display morning work or seat work instructions. Owl-Themed Clip Art ($3) - This adorable clip art pack has 8 owls and 4 backgrounds for commercial and personal use. 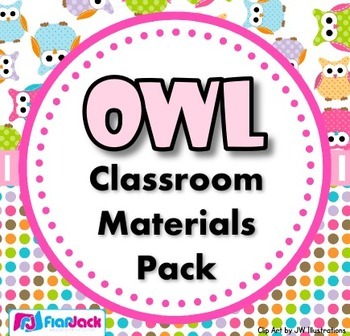 Owl-Themed Classroom Materials Pack ($10) - With over 370 positive ratings, this pack is pretty much all you need for the owl-themed classroom of your dreams!! Kinder Owl-Themed Math & Literacy Worksheets ($10) - This title includes over 160 math and literacy worksheets that will hopefully not only make your life easier (and encourage your owl fetish :P) but will also keep you at the top of your CCSS game! Seasonal Owl-Themed Editable Newsletters ($3) - This newsletter set contains 11 owl-themed PowerPoint files that can be edited, saved as a PDF, and then sent electronically to parents. 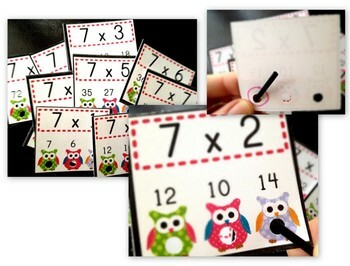 Owl Math Facts Poke Cards ($5) - Poke games are a creative, simple, self-checking way for students to practice their math facts. And the cute owl design will be sure to grab your students' attention. My students love them! H'OWL"oween Math Facts Poke Cards ($5) - Adorable Halloween version of my math facts poke cards. Owl-Themed Wide-Ruled Writing Paper ($2.00) - This resource along with manuscript writing paper are also included in the kinder worksheet pack. Owl-Themed Color Word Cards ($1.50) - Brighten your classroom with these precious owl-themed color word cards. I have also included a few of my owl freebies for easy access.